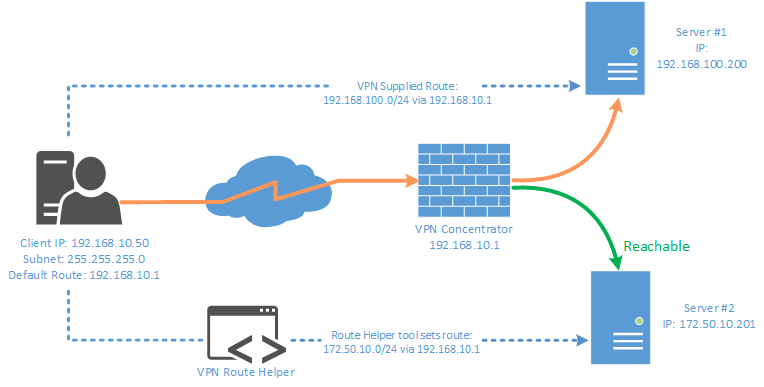 I run my own VPN that permits split-tunneling, this allows me to access infrastructure behind a VPN but not route ALL of my traffic over it (i.e. Any network that is not in my routing table will be fired off to my default gateway). When dialing my VPN whilst away from home I would often run into an issue where certain networks I needed to access via the tunnel were unavailable without me setting static routes manually. My operating system (Windows) & the type of VPN I was using were unable to set these routes autonomously based on information provided by the concentrator. Windows does not support this out of the box for simple SSTP/L2TP/PPTP VPNconnections (I think), generally a third-party client would be required [Cisco Anyconnect or OpenVPN for example]. I might look at making this a bit more “enterprisey” at some stage, its not exactly a perfect solution but does the job at a pinch. This entry was posted in C#, Networking. Bookmark the permalink.